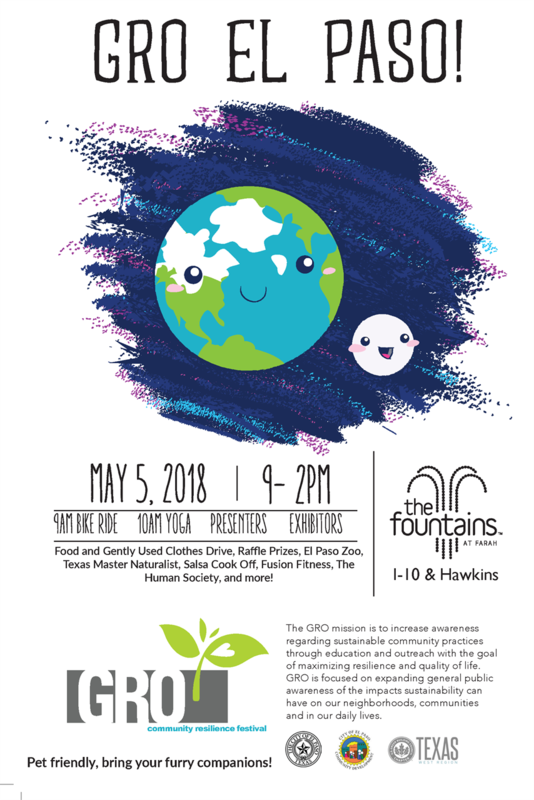 The Growth, Resilience and Opportunity (GRO) mission is to increase awareness regarding sustainable community practices through education and outreach with the goal of maximizing resilience and quality of life. GRO is focused on expanding general public awareness on the importance of community engagement & resilience and the positive impact it can have in our neighborhoods. Growth: concerns the evolution of our community through inclusive processes that begin with increasing knowledge, understanding and capacity building for all segments of the community. Positive growth is dependent on the capacity to move forward; learning from our mistakes and capitalizing on our success. Resilience: focus on how we can survive, adapt and grow in the face of chronic stresses and acute shocks. El Paso’s ability to be resilient lies in the strength of our culture, our capacity for public engagement and the positive manner in which we choose to shape our own future. Opportunity: means the formation of a set of circumstances that can make anything possible. GRO is about making sure everyone has a role to play in our sustainable future.